We all know somebody who has immigrated for college, work, family and lots of other reasons. Often the only time we get to see them is Christmas so we want to get them a fabulous gift to show them just how much we miss them. My ideas for this, include things that remind them of home that they can bring back to their new home with them!!! First I got a cardboard base covered with wrapping paper. Then I arranged the sweets and treats. Using my trusty hot glue gun to keep everything in place. I wrapped the whole hamper in cellophane. And tied it up with curling ribbon!!! These went down really well last year!!! This year I think I will do these again, maybe a giant one!!! 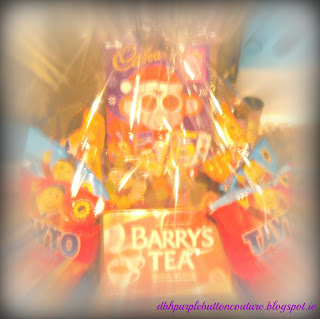 Hope you make your friends some nice Christmas Hampers. Send me pics!!! DIY hampers are SUCH a good idea. 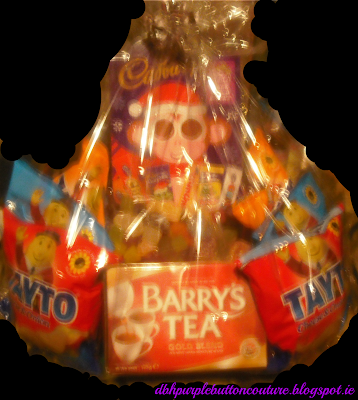 I love hampers but always find that shop-bought are so expensive and lack a little bit of personality. I find shop bought always have stuff you don't really want to bulk them up!